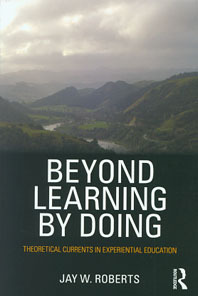 Jay Roberts, in his ambitious yet concise Beyond Learning by Doing: Theoretical currents in experiential education, attempts to address the need in the field of experiential education for a cohesive exploration in a single narrative voice of the philosophical and theoretical underpinnings of the field. While several other books on the theory and philosophy of experiential education exist, they are mostly compilations of articles and chapters written by various authors. These other books do not achieve the level of integration and in-depth theoretical grounding across the field that Roberts achieves with this book. Roberts organizes his exploration around the metaphor of a river, recognizing that from a distance, the field of experiential education may seem homogenous, as does a river when viewed from high above the rim of its canyon. Yet upon closer inspection, there are distinct currents and counter-currents that need to be recognized to navigate the river. The same is true of the field of experiential education. Roberts traces the roots of the term “experiential education,” exposing the variety of possible interpretations that have led to debate and confusion within the field. He states that experiential education is not a method or a philosophy, as some previous authors have argued, but is rather a field composed of disparate “curriculum projects” held together by “common intellectual roots, activities, and a subject of study” (7). The first two “currents” Roberts explores will be familiar to many students and practitioners of experiential education: the Romantic and the Pragmatist. For each current, Roberts summarizes the key intellectual players, with a focus on the legacy their beliefs have given to the field and what possibilities and limitations that school of thought holds for experiential education. For the Pragmatist current, Roberts summarizes work by Dewey, Mead, James, Addams, and Greene, among others. Their legacy to the experiential education includes the “value of shared, interactive experience,…the conscious connection between the school and the community,…and the sense that experience forms the genesis of social action” (64 – 66). The main critique of the Pragmatist current comes from critical pedagogues who question whether the notion of “democratic schooling,” as practiced, adequately addresses underlying issues of power and inequality. The next two “currents” Roberts explores may be new intellectual territory for many within the field. The first is Critical Pedagogy, and the second is a rationalized and instrumentalized “Neo-experiential Education.” In his exploration of Critical Pedagogy, Roberts draws on Friere, Adorno, hooks, Apple, Giroux, McLaren, and others. To a critical pedagogue, the aim of education is to create a critical consciousness that promotes emancipation for oppressed groups and strives to correct injustice and inequality. The belief that experience is “already gendered, racialized, and implicated in other forms of identity and power” (84) causes a critical pedagogue to doubt that an individual can, un-aided, reflect on his or her experience without falling prey to society’s distortions. The educator must, therefore, help “make the invisible, visible” (84). For the field of experiential education, this means asking difficult questions about diversity and inclusion in not only programs and curricula, but in underlying values and histories. In his exploration of “Neo-experiential Education,” Roberts draws on Weber, Habermas, Ritzer, and others to argue that modernization and its emphasis on instrumental rationality and standardization, introduces market ideology into education and encourages a “McDonaldization” of experience. Values of efficiency, predictability, calculability and control creep into experiential education curricula, undermining the potential for rich experience and reflection, and turning the field away from ethics of democracy and towards ethics of consumerism. The final “current” Roberts explores is the “Hopeful Current” where he considers how the field might be strengthened. These ideas include a renewed focus on processes rather than programs, a diversifying of the voices within the intellectual ancestry of the field, a building of relationships and coalitions with other educational progressives, and a renewed emphasis on the moral consequences of knowledge. Roberts argues that experiential education “has the ability to link disparate strands of progressivism and build a new vision of education–one that takes seriously the interactive role of the student, the teacher, and the community in the democratic process” (111). Covering this much intellectual ground in 129 pages is no small feat. Roberts, on the whole, succeeds in creating a succinct account of the theoretical and philosophical foundations of the field, without succumbing to overgeneralizations, misrepresentations, or unduly superficial treatments. The organizing metaphor of the river is helpful, as is his overt discussion of his decision-making processes regarding what information to include and what to omit, for example in his decision to highlight a few examples of certain indigenous conceptions of experience and in his decision to omit a more in-depth treatment of post-structuralism. Rather than presenting himself as an omniscient authority, Roberts positions himself as an intellectual explorer on a journey to understanding. He invites the reader to be a co-explorer who can question his editorial decisions and conclusions and continue further investigation. For the reader who already has a background in the authors cited, Roberts’ text is a helpful “bringing together” of a body of literature so large and diverse as to be difficult to summarize and use in reflective practice, much in the same way Richard Louv’s Last Child in the Woods summarized a vast array of studies into a coherent and memorable narrative. For a reader who is new to the authors cited, Roberts’ book provides a framework upon which more in-depth study can build, perhaps over the course of a semester in a college course. Roberts provides much-needed intellectual rigor to the field and identifies specific areas for future investigation and development.